I was trying to get strong feedback that I really understood a portion of the Mastering Bitcoin Book concerning HD wallets. The picture below is the reference for the question. Clicking the button to the right of the private key got me to another page indicating the master private chain code is 40675733fc35303c1c75bc598716f24af225528da686192ceb567c88313f8885 and the master private key is L4h3ZSQ3yfFNbovQjTGumvUGEfB1a7oFAhbkhMMFGsdDKoTSwwU8. Given these last two pieces of information and an index of 0, is it possible to issue a number a number of bx commands and concatenate their output results to feed a HMAC-SHA512 hash to arrive at private WIF key of KwMsDozFYQG7SZFwfvFRwWDhfuMJjkE669WxP6SqrpDPsCBrPV4p public address 15jbcT7wE81s8n2dbEGRFGf65zp7PHrjxh? 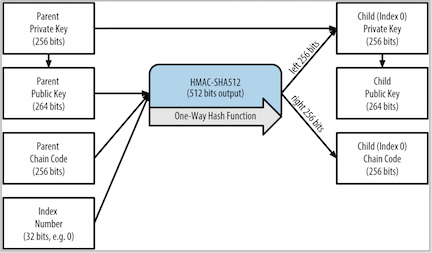 If so, how is this accomplished or does bx need to be complemented by some other command that renders HMAC-SHA512 functionality? Not the answer you're looking for? Browse other questions tagged wallet private-key bip32 hd-wallet or ask your own question. Converting from Private Key to WIF, what am i missing?